Whenever I attend any performance that involves cast members, I check out which cast member is on for the night I’m there. Then I wonder what different aspects of the character each person will bring to the part, and the decisions they make in how to interpret the role. The Canadian Opera Company is putting on La Bohème (The Bohemians) which opens on Wednesday, April 17. I decided to chat with the two sopranos portraying Musetta, a character I’ve always been drawn to. Musetta is coquettish and manipulative, but there’s more to her than that, as we’ll learn. She’s a complex character. 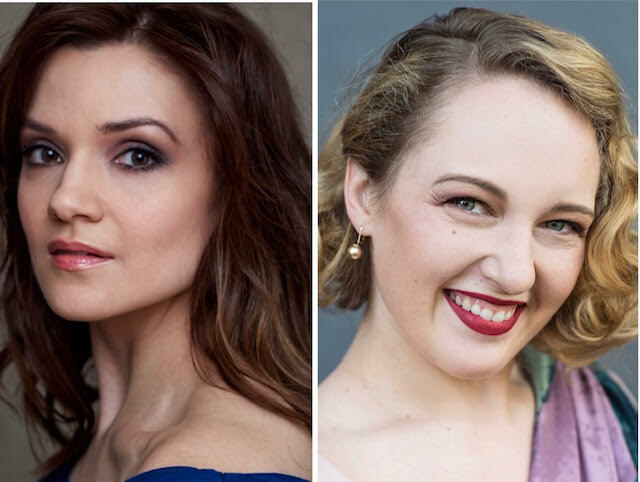 I lobbed some questions over to sopranos Andriana Chuchman and Danika Loren, who are taking on the role. You’re both playing a flirty, manipulative woman. So tell us. Was it hard to tap into that side of yourself to play this role? Andriana: Hard? Definitely not! I prepared for Musetta by method acting – just ask my poor husband how insufferable my behaviour has been the the last month leading up to rehearsals. In all seriousness, we as singing actors perform a huge variety of roles and characters, and more often have to tap into sides of ourselves that aren’t akin to who we are off the stage. If you have to play an evil character who, say, murders someone in an opera, you have to dig pretty deep and try to understand what drives this person to do such a thing. For me, playing Musetta, I ask myself: Why is she being flirty and manipulative? What does she want in that moment? Musetta can sometimes fall into a trap of coming across as superficial and brash, or as a coquettish caricature of a woman. She is smart, vivacious, knows what she wants, and has a huge heart. These are definitely points I tap into, along with the fun, flirty side. Humans are never one-dimensional. Danika: I totally agree! And Musetta isn’t one-dimensional either; she is definitely a boisterous flirt when we meet her in act two (fashionably late, of course), but in act three she is feminist defending her lifestyle choices, and in act four she is the compassionate one who has been searching for the dying Mimì. There’s a lot more to get than meets the eye (and ear), and she is a true joy to play! There’s more to Musetta than we think. Her character was based on Marie-Christine Roux, a 20-year old who modelled for artists, had a lovely voice, was funny, and accepted only young and handsome lovers. Unfortunately, she died in a ship that set sail for North Africa. What do you think was the final outcome for Musetta as we know her in the opera? Musetta is narcissistic, loves stylin’ outfits, and likes to be checked out. She would have been all over Instagram today. If she were a celebrity today, who would she most be like? Andriana: That describes MANY people on Instagram today, so it is very hard to narrow it down! When I think of a Musetta in “modern” times, (but pre-Instagram; heck, pre-internet), I think of someone like Marilyn Monroe or Zsa Zsa Gabor. If I HAD to pick someone in today’s time, with their attention-seeking/getting qualities, I’d perhaps pick the likes of Kim Kardashian, Lady Gaga, Katy Perry, and Rihanna. Danika: I think Musetta today is definitely a drag queen!! Hard to say which one… I’ll go with Bob the Drag Queen’s theatricality, but with Violet Chachki’s wardrobe and Alyssa Edwards’ je ne sais quoi. Andriana: You have pretty much summed it up for me! What is there not to look forward to? I love being back at the fabulous COC, debuting my first Musetta, collaborating and becoming fast friends with my super talented colleagues. I love discovering new coffee shops and restaurants everywhere I travel, and so far Toronto does not disappoint! Danika: It is SO nice to work at home!! I couldn’t be happier to debut my Musetta here, and for me the biggest treat has been to work with this team. Bohème really is an ensemble show, and the magic lies in the chemistry between all of the characters. Working with revival director Katherine M. Carter has also been a great pleasure; it has been a really respectful and artful process! Thank you, ladies, and toi, toi, toi! La Bohème opens on Wednesday, April 17, and runs until May 22. For details, please click here. There are $22 tickets for those under 30 – a bargain!